Photo by Chad Kainz used under Creative Commons license. When it comes to out-of-state travel in America, the two most common options are car or plane. There are downsides and advantages to both. If you prefer to travel by car, you can do it on your own time, but driving for long stretches may be taxing. Additionally, if the weather is too bad, you are not going anywhere. An airplane is quick and has no interruptions between point A and point B, but you have to deal with TSA, legroom and possible delays. Then again, there is another option: Amtrak, and it attempts to incorporate the best of both worlds. Why not turn back the clock? Amtrak train routes are available in 46 states, and the ends of some routes reach Canadian cities. The seats are roomy, and you can keep your luggage with you so that everything you might need or want is right there. The trains even provide sleeping accommodations if you want to travel overnight. Who knows, it might be nice to fall asleep and the next thing you know, you are in another city. In addition, there are many other advantages to taking Amtrak. When driving, you do not really get a chance to enjoy the scenery, but if you get an upper-level seat on an Amtrak train, you can enjoy the view all you like. Another advantage over driving is the dining car. As opposed to driving, there is no need to stop and find a place to eat. The food is reasonably priced and actually okay–it sure beats airline peanuts. Of course, you can bring your own food, too. If you like the speediness of airplanes, Amtrak might not be your best bet. Nevertheless, it is a worthwhile option for the rest of us who do not mind taking it easy. The Heartland Flyer route, which connects Oklahoma City and Fort Worth, Texas, supposedly takes a little over four hours. From my experience, it can end up being hours late. However, the last time I went, we were more or less on schedule. A big advantage over an airplane, though, is the pricing. A trip from Oklahoma City to Fort Worth and back will only cost around 70 to 80 dollars. Also, while airlines are very strict and fussy about what can be brought on board, Amtrak offers some more leeway. They do have weight and measurement requirements for luggage, but the restricted items list is not very long. 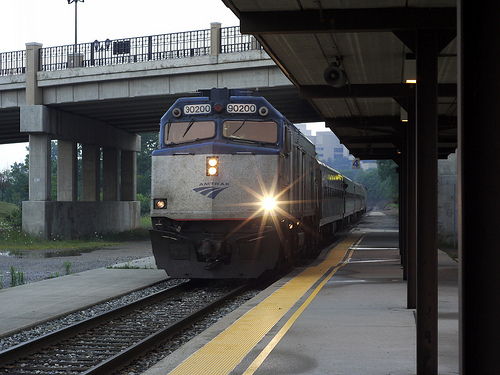 The Heartland Flyer does not happen to have Wi-Fi, but other routes do. On my last trip, we passengers were told to “pretend like it’s 1963.” Long-distance routes include suites and bedrooms and can be offered to just about any combination of adults and children. The bedroom and bedroom suite, both for adults only, come with a private bathroom. Towels, linens and bottled water are provided complimentary in all suites and bedrooms. Additionally, meals are included with sleeping accommodations. Now, who is up for a trip to Fort Worth?